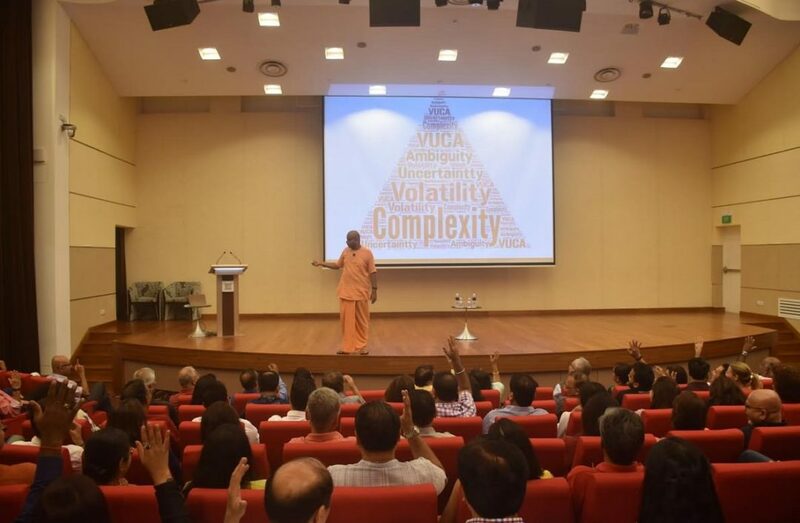 His Grace Gaurgopal Das on his maiden trip to Singapore, no less than mesmerized the audience at RELC International Hotel, who were attending an event organized by Artha Forum. Speaking on the topic “Living in VUCA world”, short for volatility, uncertainty, complexity, and ambiguity – he brought in practical applications of ancient wisdom to our challenges in the fast-paced modern world that we live in. The tone of the evening was aptly set by Mr. R. Jayachandran, Chairman of Hindu Endowments Board and ex- Non Executive Chairman of Olam International, who spoke on the simple and straight concept of “giving” and the sense of joy and fulfillment that it brings. With over a million online followers, Guargopal Das is well-known personality in Singapore as well, with a large following. 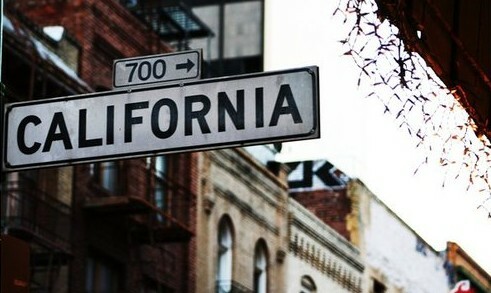 An event which was fully sold out days before, had almost five hundred attendees from all walks of life. 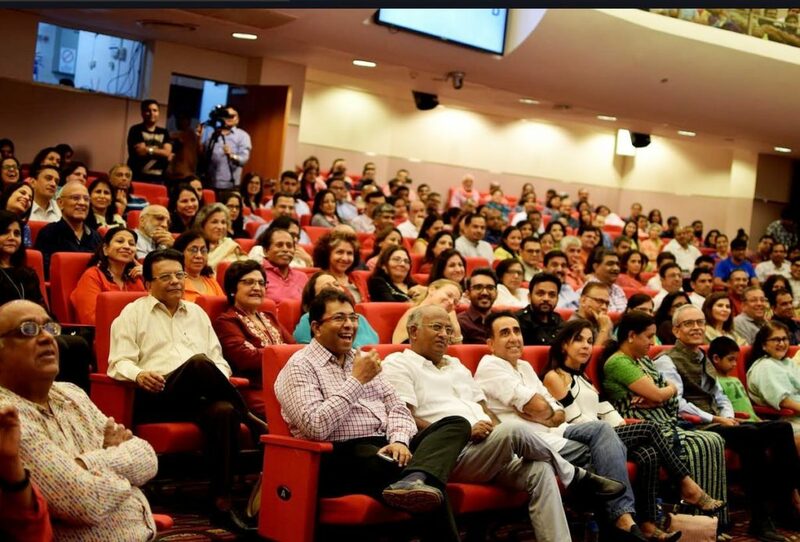 Smart and well-informed group of entrepreneurs, corporate leaders, professionals, and students gathered to hear from him, seeking for new perspectives on dealing with the mayhem around us. Filled with deep wisdom and realizations, the talk and follow-up Q&A kept everyone captivated for more than two hours. The talk brought home five key messages and their practical applications: Adapting to the change, Adopting the right attitude, Aligning the “Love to do” and “Have to do”, Adding purpose to what one does, and Accessing network laterally and building deep bonding. Gaurgopal das, with his flair of bringing across his message in lighter way, did not miss the opportunity to bring relevant and humorous examples that one can relate to. 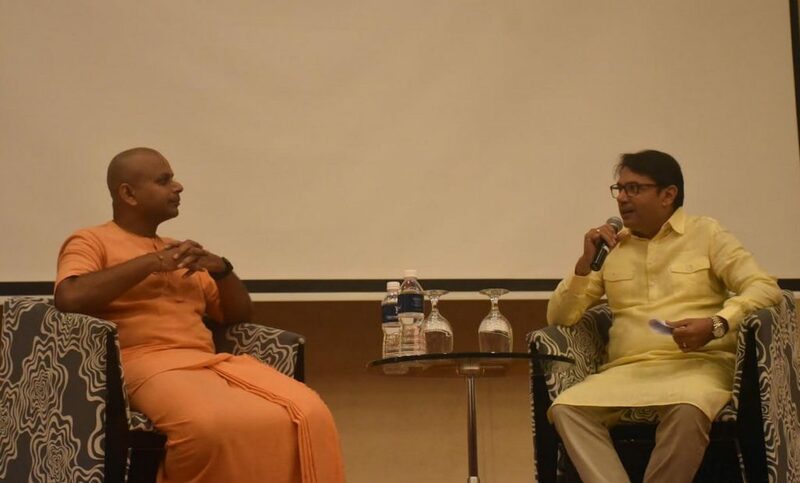 The topic of evening was set wide open with Jayesh Parekh, Managing Partner at Jungle ventures and a long-time well-wisher of the Artha Forum, moderating a very intriguing and interactive Q&A session with Gaurgopal Das. The range of questions included: whether mindful business leadership can be reality, differences between selfish, self-centered and self-love, conventional religion versus spirituality and others. Some of the eminent attendees of the evening were Pulak Prasad from Nalanda Capital, Amit Anand from Jungle Ventures, Puneet Pushkarna – General Partener at Solmark, S V Padmanabhan – President and Global Head of Finance at Olam International, K V Rao – Chairman & Director at Tata Power International, Girija Pande – Term Trustee at SINDA and Sanjiv Aiyar- President of Pan IIM Alumni Association Singapore and a long-standing well wisher of Artha forum. The event received raving feedback from the participants who claimed the session to be very inspirational and one of its kind.